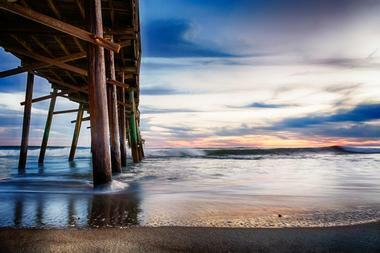 Ocean City, Maryland, is a popular beach town on the East Coast and a great place to visit year-round. The three-mile boardwalk is filled with souvenir shops and beachside eateries, perfect for those craving French fries or funnel cake. Arcades, carousels, restaurants, and vacation activities such as fishing or flying kites on the beach provide plenty of fun for the whole family. 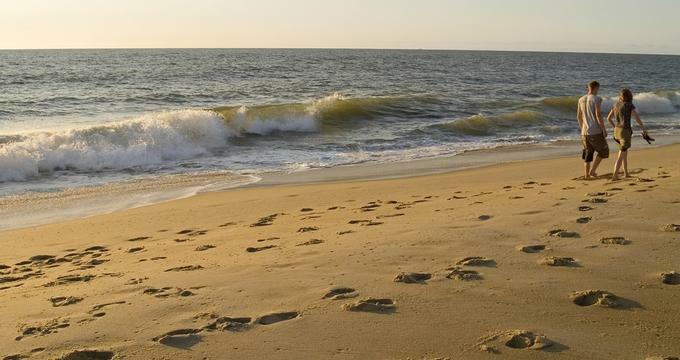 With ten miles of family-friendly beaches, Ocean City is renowned for beachside fun. Visitors and Marylanders flock to the warm sands for a fun-filled day of swimming, sunning, and surfing; two beaches are reserved daily specifically for surfing and rotate depending on the weather and waves. Those looking for a thrilling water adventure can also spend their time fishing, kayaking, or canoeing. The boardwalk has been ranked one of America's favorites by the Travel Channel and is filled with a variety of stores and arcades - it's perfect to explore on a bike ride, roller skates, or a skateboard. During the summer there are free family activities such as movies, concerts, and beach Olympics scheduled most nights. Northside Park, one of the largest and most popular parks in Ocean City, is a 58-acre complex with a lighted soccer field, three lighted baseball/softball fields, a multipurpose field, a footbridge, a fishing lagoon, two piers, two playgrounds, picnic areas, concession stands, a gazebo, and a walking/jogging path. There is a 21,000 square foot multi-sport sports arena as well as a 14,200 square foot building housing a gymnasium, community room, conference room, sitting areas, kitchen, and a patio. Families are invited to spend the day at the park taking part in one of many sports, enjoying a walk through the well-preserved grounds, or relaxing by the waters. Dating back to 1902, Ocean City's Boardwalk, officially known as Atlantic Avenue, is recognized as one of the best boardwalks in the country by many. Other than lodgings and casual eateries, there are fine dining restaurants, amusements such as museums, and a thriving nightlife on the 2 ½ mile length promenade. The Boardwalk blends culture and history in the many businesses that can be found there - for example the Inlet Indian sculpture of the Assateague Indian carved out of 100-year old oak can be found alongside the Ocean City Life-Saving Station Museum and the United States Coast Guard Tower. No visit to the boardwalk is complete without visiting one of the oldest fixtures, Trimper's Carousel. 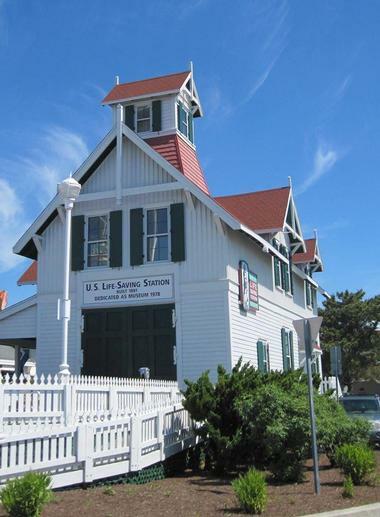 The former home of the Ocean City Life-Saving station, the building now houses the Ocean City Life-Saving Station Museum. The actual life-saving station has moved inland, but visitors can explore the original structure which dates back to 1878 - including the original color scheme of white walls, red roof, and green trim, which date back to when the building was operated by the Coast Guard. Exhibits take visitors back in time with stories and artifacts of the heroic surfers of Ocean City, while an entire wing is dedicated to genealogy, where visitors can look up their ancestral history. The Art League of Ocean City is a non-profit organization that was created for people to appreciate, create, and be inspired by art. Visitors can explore the two-story gallery which exhibits works from local and regional artists. The exhibits are updated with newer work monthly and each new exhibit kicks off with a reception on the first Friday of each month - these are open to the public. Those who wish to get crafty themselves can schedule some time in the pottery studio, take an art class by one of the many artists, or work in peace in one of the five working artist studios. There are also workshops, art camp programs, and community events for people of all ages and skill levels. 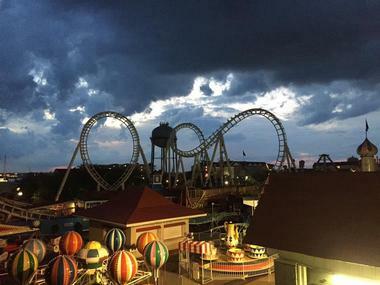 Trimper's Amusement Park and rides is a historic part of Ocean City. It has been owned and operated by the same family for over 100 years and offers a carnival-like atmosphere with fun rides, dazzling lights, and concession stands selling treats such as cotton candy, popcorn, funnel cake, and everything else you would expect at a boardwalk. For most people, it's tradition to spend a day at Trimper's when visiting Ocean City. 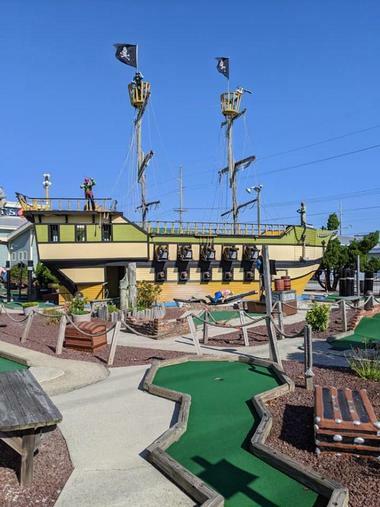 Trimper's includes two hotels, a theater, and of course, the amusement park - the significant site offers a guaranteed fun time for the entire family. Just five miles from Ocean City, Frontier Town is an award-winning camping experience located right alongside the Sinepuxent Bay. One of the nicest, family-friendly outdoor experiences in Maryland, Frontier Town offers over 600 campsites to choose from and has all the amenities visitors would need on site. Families can relax at the waterpark and wind through Lazy River, have an exhilarating race down the waterslides, or play 18 holes of miniature golf surrounded by towering trees and waterfalls. Frontier Town also has a zip line through the forest at the High Ropes Adventure Park and wild-wild west shows at the Western Theme Park. Other activities include fishing off the pier or on a chartered boat, kayaking, or shopping at the arcade and gift shop. Jolly Roger Amusement Park is a combination of four separate parks filled with waterslides, rides, games, amusements, and more. Visitors can visit just one park or all four - the entire family will love sliding down the waterslides at Splash Mountain but they'll also enjoy the exhilaration of speeding around the go-kart tracks at Speedworld. Other activities include mini golf, a petting zoo, relaxing on the pier, or enjoying the numerous other rides and attractions. Families can reenergize themselves with a meal from the many on-site restaurants or concession stands, including the classic Thrasher's French Fries at this Ocean City landmark. Fractured Prune Donuts, established in 1976, has Ocean City covered. With six stores in Ocean City, guests have a half dozen choices when it comes to creating their ideal donut. Whether you're on the way to the beach or on the way home, it's a great idea to stop for a treat. 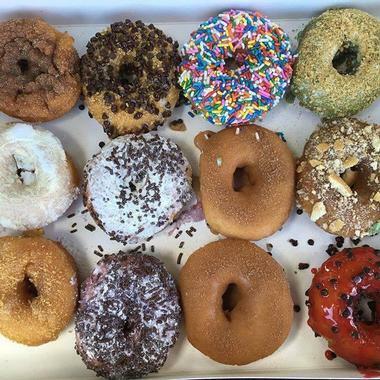 In their stories, Fractured Prune offers 19 glazes: blackberry, banana, caramel, blueberry, cherry, honey, chocolate, lemon, key lime, maple, mocha, marshmallow, mint, orange, mixed berry, peach, strawberry, raspberry, and vanilla. Additionally, they offer 13 toppings: cinnamon and sugar, chocolate sprinkles, cookie crumbs, graham crackers, crumbled bacon, granulated sugar, mini candy-coated chocolates, mini chocolate chips, mini marshmallows, rainbow sprinkles, powdered sugar, vanilla wafers, and sea salt. You can pick and choose whatever combinations you like. Rally Helicopters Private Tours is an aviation experience like no other. The owner and chief pilot is hands-on in creating tours that highlight the best aspects of Ocean City from the sky. The tour routes go through gorgeous golf courses, farm country, the Assateague beaches with wild ponies, downtown OC, the OC harbor, by Fenwick Island and the historic lighthouse, and of course, scenic Ocean City among other places depending on which tour is chosen. For example, the Ocean Pines and Back Bay Tour leaves the airport and heads out over old farms, the Veteran's Memorial, White Horse Park, along St. Martins River, and the Ocean Pines Yacht Club - visitors can pick a tour based on the experience they want! Visitors of Paradise Watersports should prepare themselves for an unforgettable Ocean City-style parasailing and jet skiing experience. The adrenaline rush is indescribable as locals and visitors rent and ride the super-fast Sea-Doo jet skis - guaranteed to go speeds which will thrill the entire family no matter how old (or young) they are. 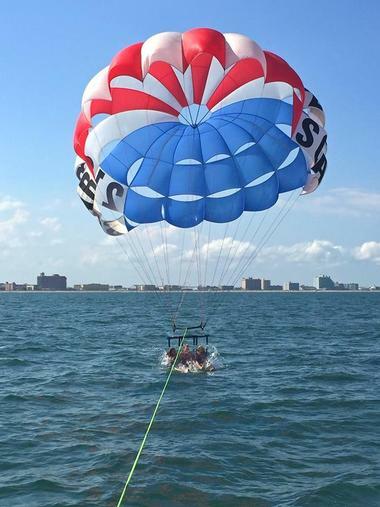 The parasailing experience offered by Paradise Watersports is breathtaking as visitors fly over the wild ponies of Assateague, gorgeous sea turtles, and dolphins in the distance, while getting a bird's-eye view of Maryland, Virginia, and Delaware. Adventurous families are invited to join Expedition Guides to follow the trek of Professor Ephraim A. Hacker, in his search for gold and diamonds. A famous archaeologist, explorer, anthropologist, part-time taxidermist, and paleontologist, Professor Duffer A. Hacker headed two expeditions in the 1930's to the Fogclift Islands off the coast of South America. His purpose there was to uncover ancient diamond and gold mines said to be hidden on the Islands. The golf course encourages you to follow in the footsteps of Professor Hacker to putt-putt your way through one of his adventurous expeditions - complete with caves, mountains, and waterfalls - to find the hidden treasures. Liquid Paddle Company offers stand up paddle board and kayak rentals, sales, and sunset tours. It also offers evening tours on glowing paddle boards. 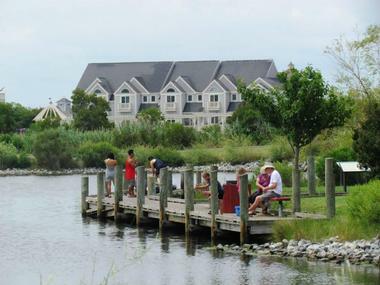 Guests launch along a shallow cove where visitors can find amazing diamondback terrapins, plus other wildlife. This marvelous coastal inlet is the ideal venue to practice and master the art of paddle boarding. Liquid Paddle caters to guests of all experience levels, from beginner to pro's. The staff will provide training and tips first timers need for a great trip on the water. One and two passenger kayaks are available for rental. Liquid Paddle has a beachside facility on the open bay. Paddlers can paddle up to and under the 60th Street Bridge, explore the shallow waters of the environmentally sensitive shoreline or just enjoy the views. The view of the sunset over the western shoreline is breathtaking. Accompanied tours are available. With 11 locations in Ocean City, Candy Kitchen is the place to visit for treats such as taffies, fudge, chocolates, gummies, truffles, pretzels, and novelty items. Candy Kitchen has been creating creamy fudge, salt water taffy, and mouth-watering hand-dipped chocolates since 1937. Candy Kitchen is still a family owned business that relies on quality, fresh ingredients and long-standing recipes. 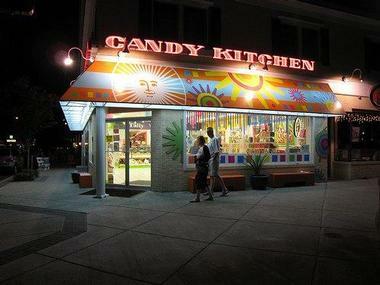 When families want a little something sweet to take along to beach, Candy Kitchen is there to satisfy their desires. All items are also available online. Packaging for the holidays and gift baskets are also available. When vacationing in Ocean City, customers can choose from three Flashback Old Time Photos locations for fine antique portraits and classic antique-style frames. The company has been providing these novelties for 35 years. Subjects may pose in fanciful costumes that cover the periods from the 1840s to the 1930s with all of the props needed to complete the look. Visitors may become a saloon girl, cowboy, Civil War general, Victorian lady and gentleman, southern belle, southern gentleman, pirate, hillbilly, French maid, gangster, Keystone Cop, flapper, or just about anyone else they can imagine from the old days. 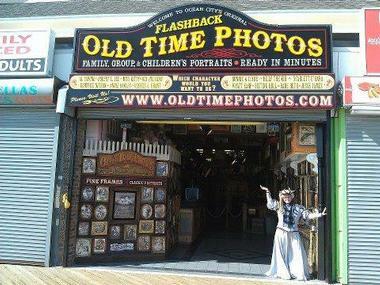 Flashback Old Time Photos specializes in family portraits, large groups, and children's photos and will have your photographs ready in minutes - so stop in on your way to or from the beach for some great family fun. 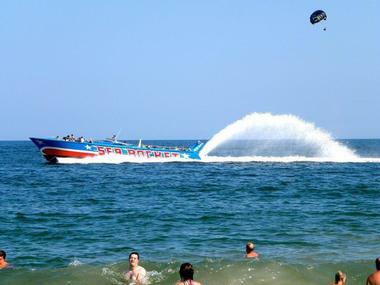 Sea Rocket Adventures offers fun activities in Ocean City, MD. Sea Rocket offers ocean boat rides, banana boat fun, kayaking, sailing tours, parasailing, paddle boarding, and much more. The water-based attraction includes water trampolines, waterslides, and a climbing wall that is fun for the entire family. Guests can enjoy the refreshing waters of Ocean City from a catamaran or bask in the sun in true tropical island style. Need a break from the hot sun and surf? Then head to the Carousel Oceanfront Hotel and Condos for an afternoon of ice skating on the oceanfront. If you're in the mood to party, catch the live ice show nightly at 6:30 PM, featuring the Next Ice Age skaters. Performances are offered only during June, July, and August, but there are no performances on July 7th and 8th. Admission is free. If there's a birthday party in your future, the Carousel ice skating rink is the perfect place to host it. Parties are offered mostly from October to May for two-hour time slots on Fridays or Sundays. Call the hotel for details and availability. 18.Ripley's Believe It or Not! Ripley's Believe It or Not! 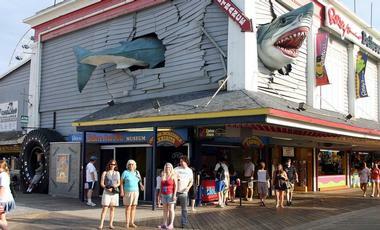 has three attractions in Ocean City. There is the original Ripley's Believe It or Not! Odditorium - the only place in town to see 12-foot tall Transformer car parts, a shrunken head, unique artwork, two-headed animals, and the world's rarest egg. In Ripley's Marvelous Mirror Maze, guests will come face to face: with themselves while they try to find their way out of the maze of LED lights and mirrors. At Ripley's Impossible Laser Race, guests are invited to make their way through another labyrinth - this time, moving under and over lasers as quickly as possible to get to the end of the maze. Just beyond the final laser, guests will press a stop button to complete the challenge - and to get a score and time.